Let Us Be The Only Showroom You Visit! We deliver to the Long Island area: Suffolk & Nassau Counties; Mineola, Copiague, Massapequa, Lindenhurst and West Islip. 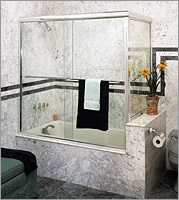 Contact us for custom glass shower doors and bath mirrors. We deliver to Mineola, Copiague, West Babylon, Manhattan, Bronx, Brooklyn, Queens, Hamptons, and Long Island, Suffolk, and Nassau County, NY. Glass Door experts! We offer the best in Glass Doors! Contact us at (631) 842-2515 for simply stunning glass shower doors and bath mirrors throughout Long Island, Suffolk & Nassau Counties, Manhattan, Brooklyn, Bronx, Queens, and the Hamptons, New York.